In 1971, Robert James Fischer (nicknamed Bobby) shocked the chess world by winning 19 consecutive games against an extremely high level of competition. This feat has been compared to throwing back-to-back no-hitters in major league baseball. During his peak playing period, from the mid 1960s into the early ’70s, players spoke of “Fischer Fever,” where they felt ill just having to play against him. Just as with José Raúl Capablanca, Fischer had an aura of invincibility — which wasn’t far from the truth. Fischer was head and shoulders above the best players of his day. His abrupt withdrawal from chess was tragic. Rumors of Fischer sightings were rampant, and the public was often tantalized by stories of his impending reemergence. Unfortunately, Fischer waited more than 20 years before playing in public again. His behavior, always intense, became increasingly odd over the years and prevented him from ever again competing at the highest levels. The position in part a of the following figure occurred in the game Fischer-Bent Larsen from Potoroz in 1958. It’s white’s turn to move. How does white crack black’s defense? White plays 22. Rxh5. Fischer sacrifices his rook to open lines for his coming attack. 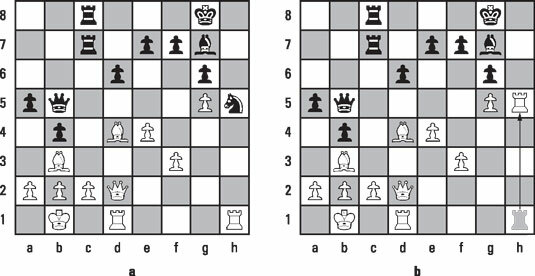 The white rook captures the black knight on h5, which was unusual because of the material sacrifice involved. In the old pre-Internet days, good study material from the games of the masters was hard to come by. This game, however, became famous, and to claim that by the 1970s all serious U.S. students of the game were familiar with this type of sacrifice is no exaggeration. This is the best try, but it fails to save the game. White avoids 26. Bxd5 to steer clear of the response 26… Rxc2. If 31… . Be7, 32. Qh6#. If 31… . Kg7, then 32. Rg1+ wins the bishop and will mate. Sacrificing the exchange, as Fischer did in this game, in order to open lines of attack against the enemy king, is now part of every serious player’s arsenal of weapons.